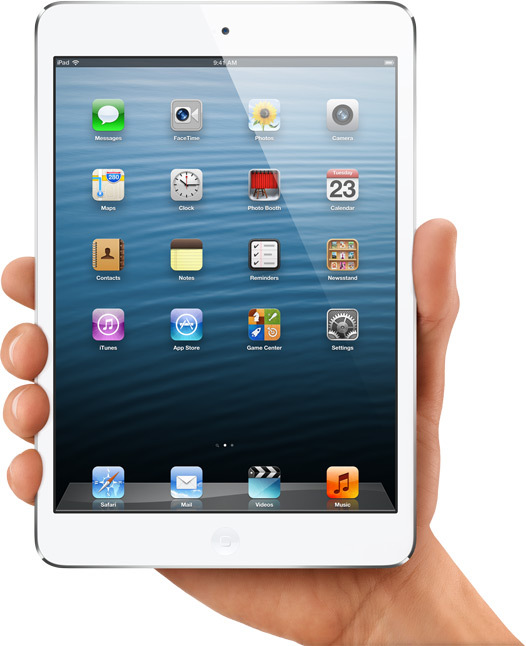 Yesterday Apple Corporation announced the impending release of the iPad Mini. Before I begin this, let me tell you I am an Apple fan, as my members well know. I have an iPad, an iMac, an iPhone, a Mac Mini, an iPod, Apple TV, and a MacBook Pro. I usually get a new Apple product within days, if not the first day, of their release. I was really disappointed with the iPad Mini, which I will not purchase for myself. I was really disappointed with the Ipad 4th Generation, which I will not purchase for myself. The iPad Mini is not a smaller version of the 3rd or 4th generation iPad. Rather, it’s a scaled down version of the iPad 2 which means there is no retina display – and if you’ve ever held an iPad 3/4 or iPhone 5, you know what I mean. The screen quality is better than most but still not up to par with the Ipad 3/4. Also, the price point is high. You can get other handheld tablets for around $200 – that includes the Kindle Fire HD and other units. But starting, not ending, at $300 plus is ridiculous and too high. The iPad 4th Generation . . . is – dang, I just purchased the 3rd Generation six months ago. If Apple thinks I’m some kind of Apple junkie (please disregard paragraph one) and jump out there and purchase it blindly knowing that there will be an iPad 5th Generation next year – you’re crazy. The only real difference in the 4 from the 3 is the lighting power source and the A6 chip, which is supposed to be twice as fast – I’ll take their word for that, but my iPad is very fast as is. I considered buying the new iPad notebook, 13″ with the Retina display, however, I’m like a lot of people who are not using laptops anymore. Since the iPad came out, I very rarely use my laptop and I’ve considered selling it and making due with what I have – my desktop and my iPad. Since I’m a pastor let me tell you I type my messages on my iMac and then save them to the cloud on Dropbox and then I access it and preach from my iPad. Notice there was no mention of the laptop. I went to Texas and didn’t carry my laptop. I went to Louisville for a couple of days and didn’t carry my laptop. I went to Cleveland and didn’t carry my laptop. It’s becoming obsolete. I think Apple should consider making a more memory friendly laptop (with 1 TB or 2 TB) with all the bells and whistles as a replacement for desktop computers and not a supplement. I’m researching their new iMac and that may be a purchase in the next few months, Lord and cash willing. a. If I had to choose between the iPad and the iPad Mini – choose the iPad, especially if you’re older and have eye issues. b. If I had to choose between replacing a laptop (if it’s old and creaky) – yes, get the new MacBook Pro. c. If I had to choose between a late model MacBook Pro and the new one – take a pass, wait until next year or 2014.
d. If I had to choose between a late model iMac and the new iMac – no decision yet – buyer’s option. e. If I had to choose between the iPad 3 and the iPad 4 – stick with the 3 and wait until 2013 for the newest edition. f. If I had to choose between the old Mac Mini and the new Mac Mini – yes, get the new Mac Mini.